Ok, so now that you have chosen your fabric, colors and pattern, you now need to design your templates, should you choose to use them. 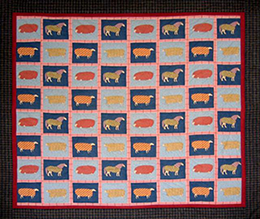 If you are making a straight forward patchwork quilt made from squares and sashing then you might not need to use templates and can successfully cut out accurate squares and patches using a rotary cutter and rotary board. Simply find your size square and cut using these lines and you will have perfect squares. If you are making a quilt using appliqué or a variety of shapes and designs then it will pay to use templates. Cut out your templates using a rotary cutter and rotary board. However, make sure it is not the same rotary cutter you use for cutting material as the thicker plastic, cardboard or acrylic materials can blunt the blade. There are a number of ways to use templates to transfer the appliqué material shapes onto your quilt top. Please refer to the appliqué techniques section to see how this is done.